State U/21 1948 to 1951 inclusive. Captain 1950. State Seniors 1952 to 1962 inclusive. State Captain 1957, 59, 60, 61, 62. Australian representative 1960 and Olympic Captain 1960. 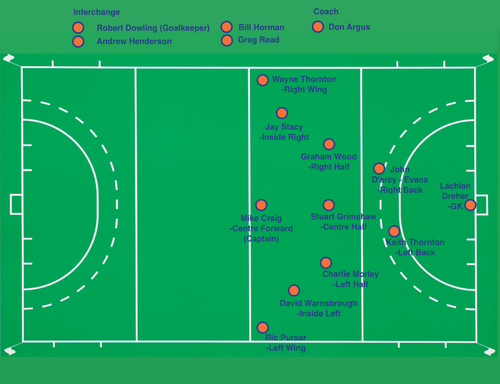 Played in all positions on the forward line for Camberwell from 1948 to 1960’s. Leading goal scorer on more than one occasion. Had a distinguished interstate career capped off by selection as Captain of 1960 Australian Olympic team. A dynamic, skilful, hard working player who was always looking for ways to improve. A lucid, thoughtful hockey brain. Played in many premiership teams. U/21 State 1979, 80. State Seniors 1980, 81, 82. Accomplished full back who could turn defence into attack with his accurate passing. Premiership player in the 1980’s and early 1990’s. Australian representative 1989 to 2000 inclusive. Played in 2 Olympics, 2 World Cups, and 11 Champions Trophy tournaments. Has played 140 games in total for Australia. State U/21 1985 to 1988 inclusive. State Seniors 1988 to 2000 inclusive. An energetic sure-footed keeper who has served country and state well. Appears to be fearless in goals and attacks the ball with gusto. Played in 2 State League premiership teams. U/21 New Zealand representative and 1984 Olympian with New Zealand. An exciting “never say die” player who played in all half positions. Played in all premierships in the 1980’s and early 1990’s. He became Club Captain and then captain/coach. When a Back was required he more than ‘filled the bill”. State U/21 1987 to 1990 inclusive. State Seniors 1991 to 1994 and 1996 to 2000. Talented player who gives his all every game. Premiership player 1980’s and 1990’s and current Club Captain. Has been used successfully on Half line. U/21 State 1950 to 1953 inclusive. Captain 1952 and 53. State Seniors 1954 to 1965 inclusive. Played in premiership teams in the 1950’s. Scrupulously fair, very quick Back. State Seniors 1937, 38, 39, 46, 47, 49, 50 and 51. Australian representative 1948, Australian Captain 1948, Australian Coach 1948, 50, 60, 64 and 66. State Coach 1946 to 1965 inclusive. Captain Coach Camberwell. Another player whose hockey career was interrupted by the War. Left Half in the premiership teams of the 1930’s and 1940’s. Brilliant hockey “brain” who in many respects was ahead of his time. Finished his playing career on the forward line. State Representative 1984 to 1992. Junior World Cup 1984. Australian representative 1985. Coach of U/21 State Team 1998 to 2000. Coached Camberwell State League team for three years in the 1990’s. An extremely talented player who could play both Half and Forward. Played in four premiership teams. Australian representative 1988 to 2000 inclusive. Has played in 3 Olympics, 3 World Cups, 13 Champions Trophy Tournaments, and Commonwealth Games. Played over 300 games for Australia and was named as the International Player of the Year in 2000. An outstanding record for an outstanding player whose strength and mobility on the ground is amazing. Played State hockey on many occasions and a premiership player for Camberwell. State U/21 1951, 52. State Seniors 1953 to 58, 60 and 61. A leading Victorian forward with a multitude of skills. Vied with Mike Craig for leading goal scorer. Transferred to start Greensborough Hockey Club in 1961. Became a successful coach and coached U.S.A. for 5 years. U/21 State 1979, 80. State Seniors 1981 to 1985 inclusive. Club goalie in five premierships in the 1980’s and early 1990’s. Brilliant attacking and aggressive keeper. Australian representative 1985 to 1998 inclusive. Played in 2 Olympics, 3 World Cups, a Junior World Cup and 9 Champions Trophy Tournaments. Played in well over 200 games for Australia and represented the State Seniors from 1985 to 1998 after having played in representative sides from U/12 through to Seniors. Magical player whose ball skills and disposal at times seem unbelievable. Former Club Captain and present Club Coach. State Seniors 1956 to 1967 inclusive. State Captain 1965, 66. Australian representative 1960, 63, 64. Olympian 1960 and 1964. A talented Half who didn’t know the meaning of defeat. Played in three premiership teams in the 1950’s. Club Captain mid sixties. Australian representative 1948 and 1950. State Seniors 1946 to 1953 inclusive. State Captain 1952 and 1953. Brilliant full back with an impressive record. Played in all premiership teams between 1946 and 1953. Later to become Club President and then Patron. Playing career curtailed too soon. Father of Anthony and Wayne. State U/21 1976 to 1980 inclusive. State Seniors 1977 to 1983 inclusive. Australian representative 1980 and 1981. Former Club Captain. An extremely talented player who from an early age represented the State from U/12 through to Senior level. Excellent ball skills, which caused havoc with many teams defences. Premiership player of early 1980’s. Coached the State League team for 12 years from 1980. Came to the Club from Queensland where he had success coaching Redcliff. He is uncanny in his ability to read the play and, more importantly, the players. Extremely successful with Camberwell coaching five premierships. He has never coached a team anywhere that has not finished the season in the “Four”.